Here are some photos (in 2 sections) of my recent trip to British Columbia....enjoy! 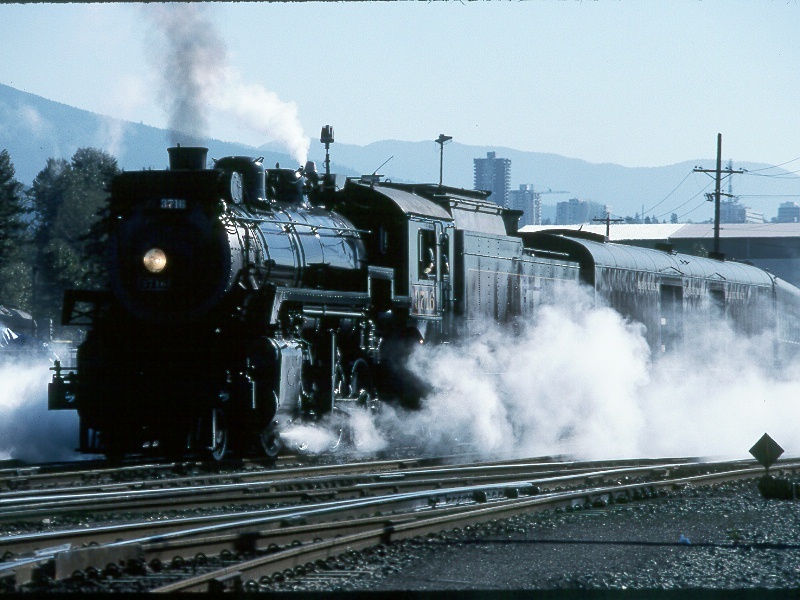 After flying from Phoenix to Seattle, then renting a car and spending the night in Bellingham, the next morning we got up early and highballed for N. Vancouver, and got there about 15 minutes before the "Royal Hudson" train left...powered with an ex CPR 2-8-0 while the Royal Hudson undergoes repairs. 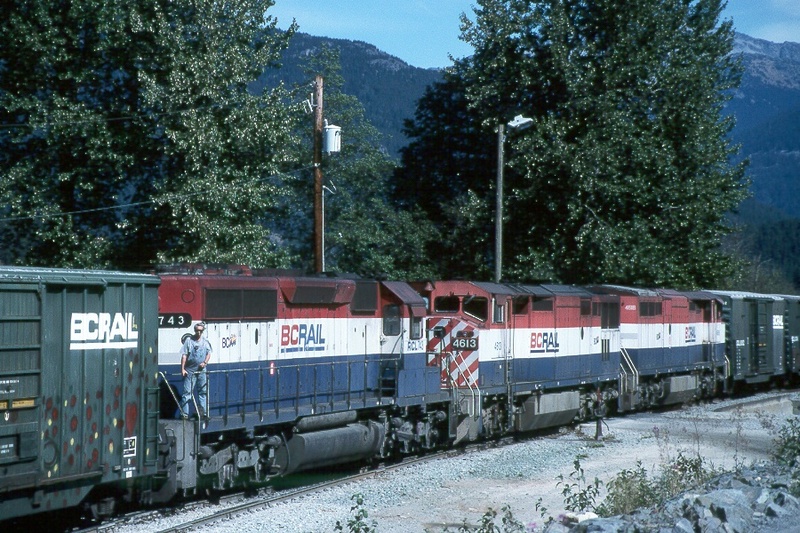 Sept. 5, 1998 at North Vancouver. 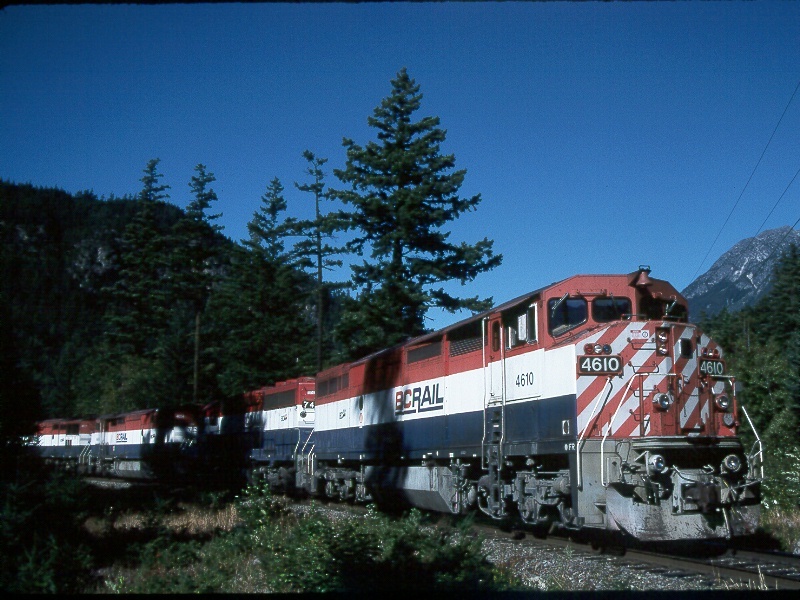 This is a Cat repowered RS18 with it's slug rebuilt from an RS3 switching the N. Van yard early in the morning of Sept. 5, 1998. 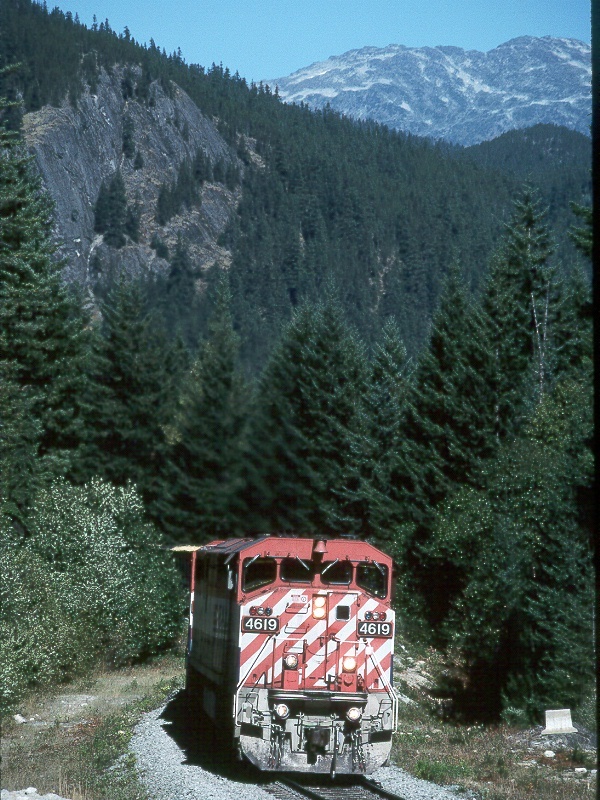 We then drove up to Mons (just north of Whistler) and got this northbound freight in the hole waiting on a southbound...about noon on Sept. 5. Within a few minutes the southbound freight showed up and begins slowing to a stop in order to cut out his helpers. 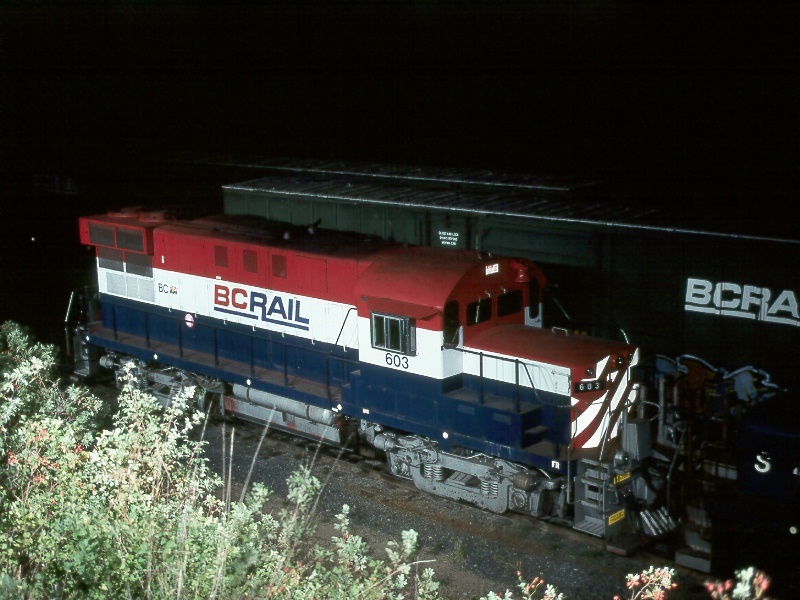 Mons, BC on Sept. 5, 1998. This is the 3 unit helper set that will soon be cut out here at Mons. 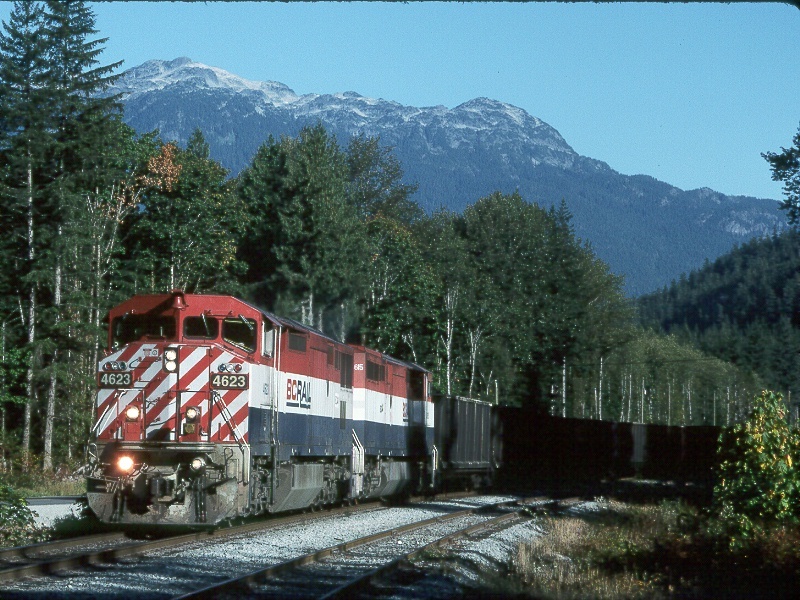 It will follow the northbound freight north as far as D'Arcy and then help another southbound over the 2.2% grades. 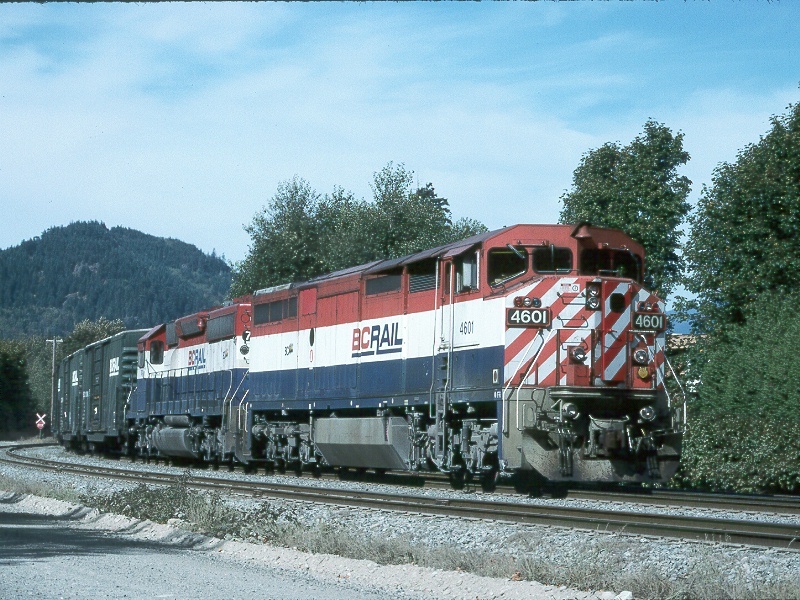 Mons, BC on Sept. 5, 1998. 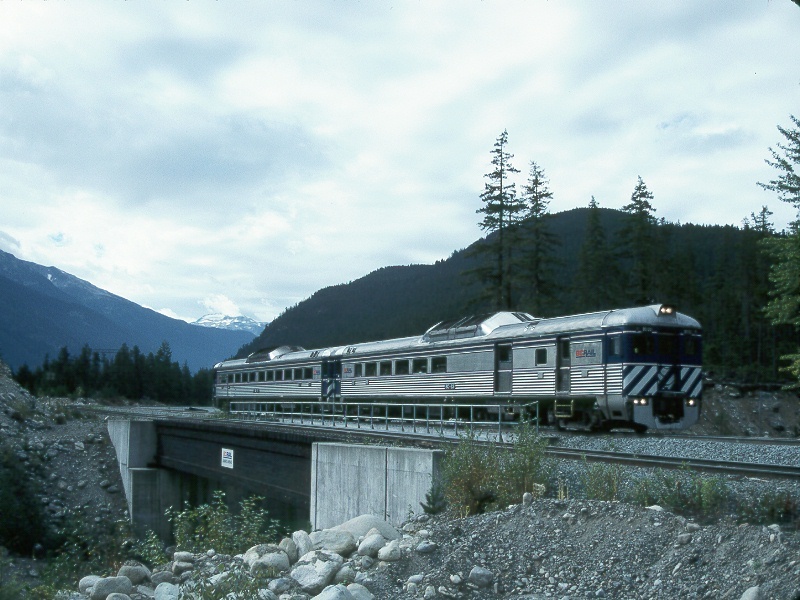 Here is the southbound freight filmed earlier at Mons now at Squamish awaiting a new crew. Sept. 5, 1998. We then went to the West Coast Museum in Squamish and really enjoyed the visit there. They have a lot of good things to see, including this restored RSC3. Sept. 5, 1998. 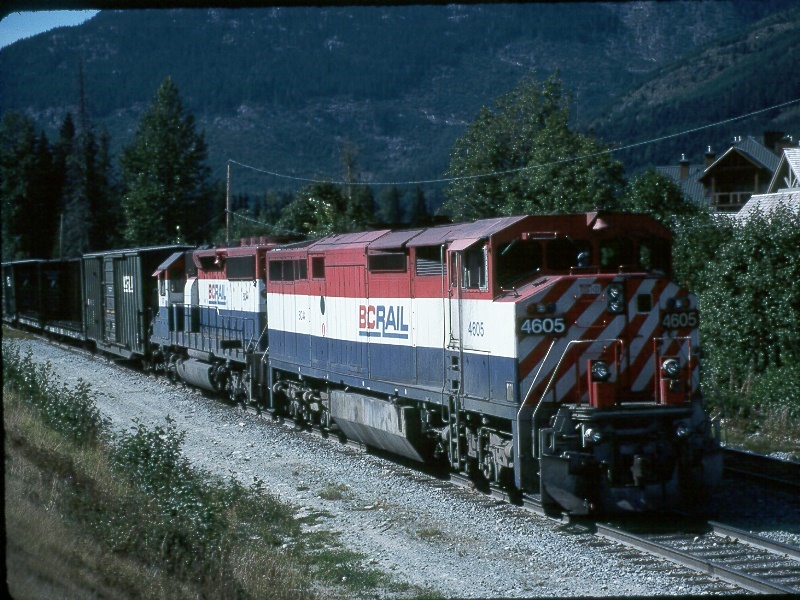 The next morning we went north of Squamish to Cheakamus to get this southbound freight. The sun has just cleared the mountainsides at about 930am on Sept. 6, 1998. 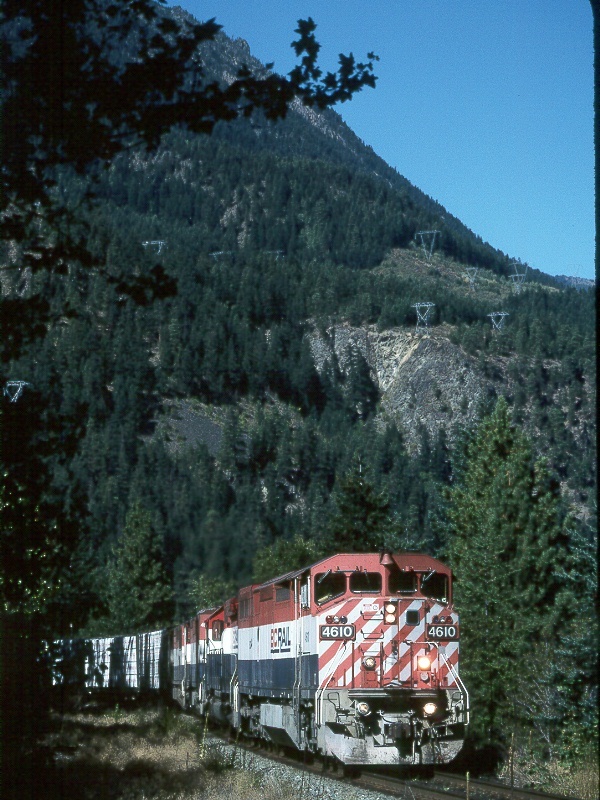 After getting some more photos of the southbound freight at Squamish and Britannia, we then chased a northbound freight and got this shot at Green River, where a tree branch reached out and ripped my t-shirt from the Nevada Northern in Ely...oh well - I got a nice photo from it anyways. Sept. 6, 1998. 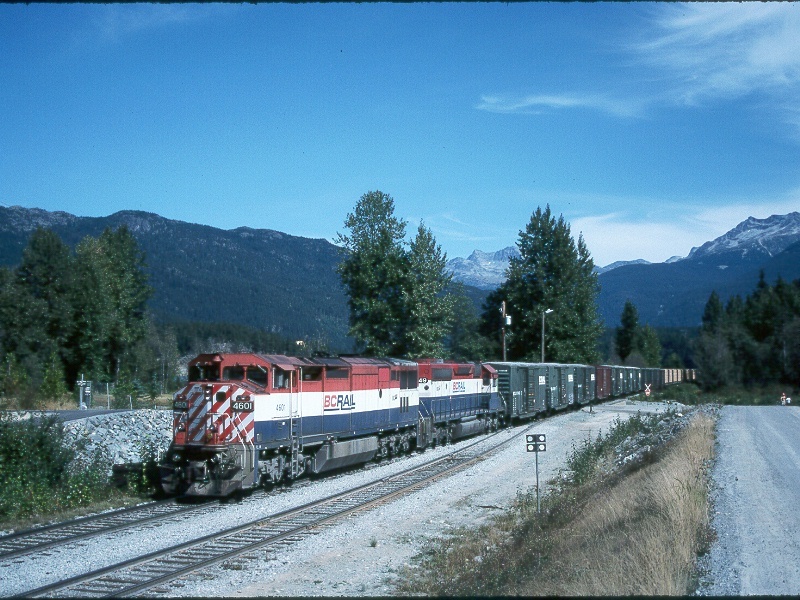 At D'Arcy we picked up another southbound freight, as shown here just north of the station there. Sept. 6, 1998. 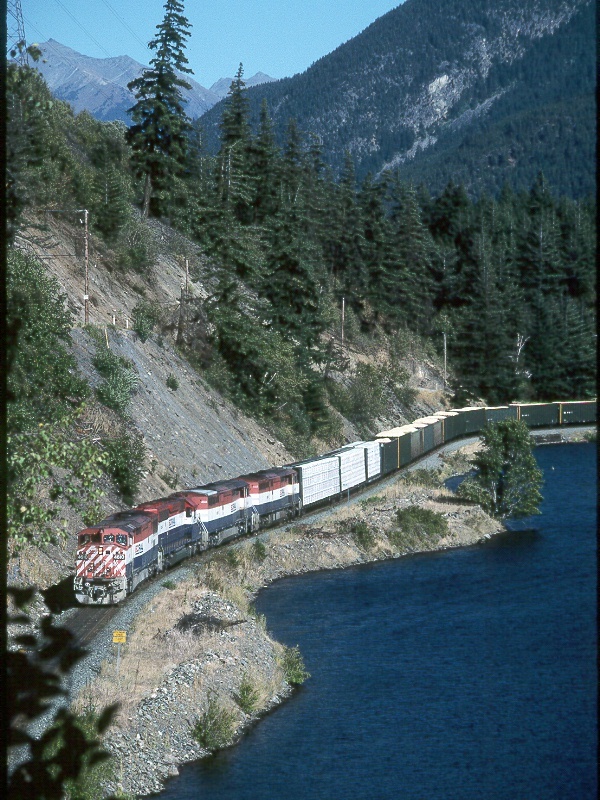 Here is the same train shown further south traveling beside Gates Lake near Birken on Sept. 6, 1998. And another shot, this time with the wide angle zoom at the highway crossing near Spetch. Sept. 6, 1998. The next day found us chasing the northbound Budd Cars, shown here at Tisdall - Sept. 7, 1998. 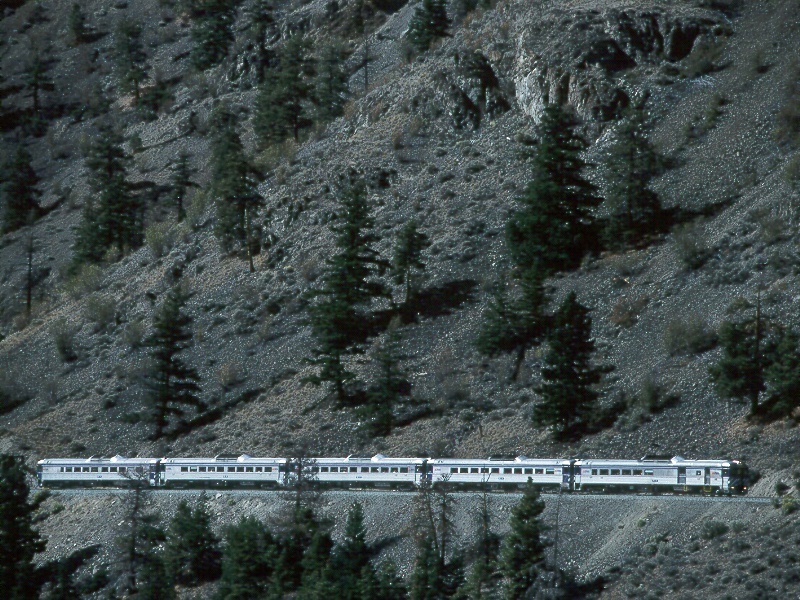 After some more photos of the northbound Budd's, we highballed to Pavilion and got this 5 car set of Budd Cars southbound at the horseshoe curve. Sept. 7, 1998. Here at Kelly Lake we got a shot of this light unit running south to help a stalled northbound freight at Moran. The northbound's mid-train helper had quit, and he could not lift his train on the 2.2% grade after clearing the 5 car Budd set. 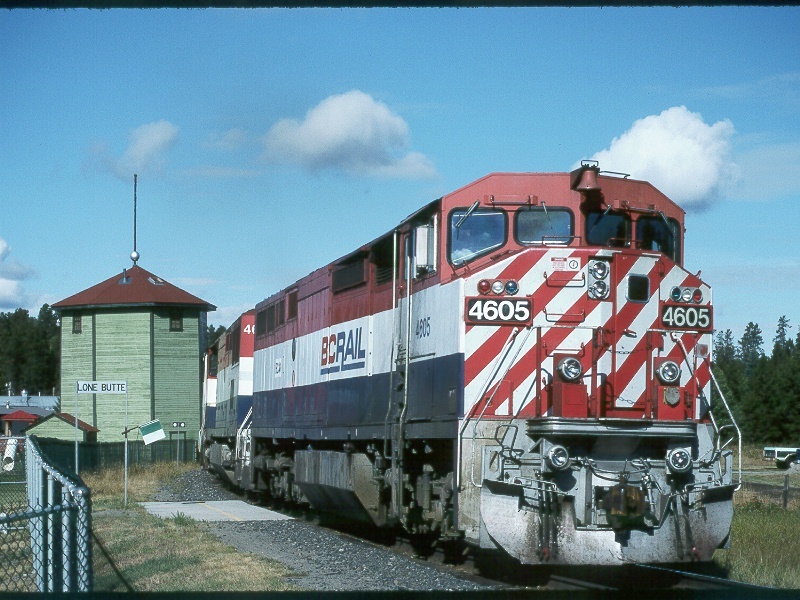 This is one of the ex-Santa Fe units looking good in fresh paint at the road crossing just south of Kelly Lake. Sept. 7, 1998. We then drove north to 100 Mile House (Exeter) for the night, and we got this RS18 (Cat) in the yard shut down for the night. 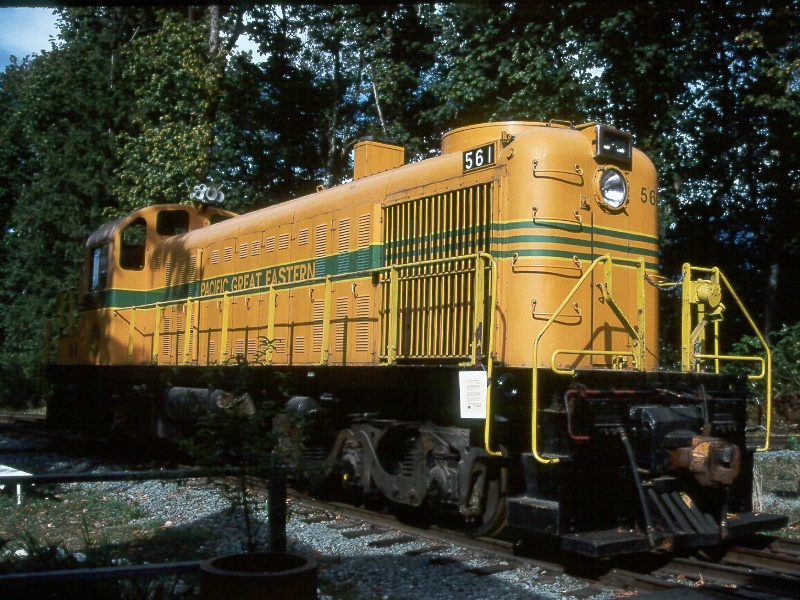 We used 8 or 9 M5B flashbulbs on Kodachrome 64 film at f5.6. Flash Lighting by John Sharp. Sept. 7, 1998. 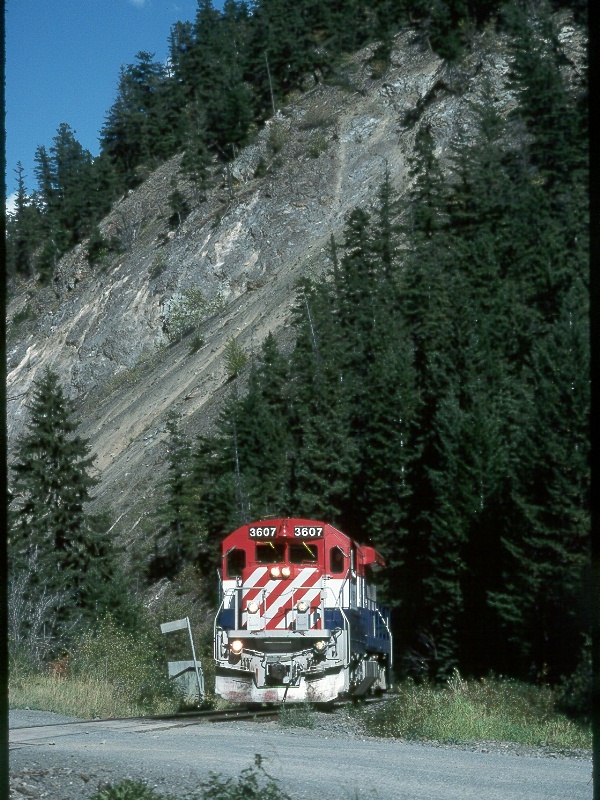 On Sept. 8, 1998 we got this southbound freight at Lone Butte going by the old enclosed water tank that is now part of a small museum. 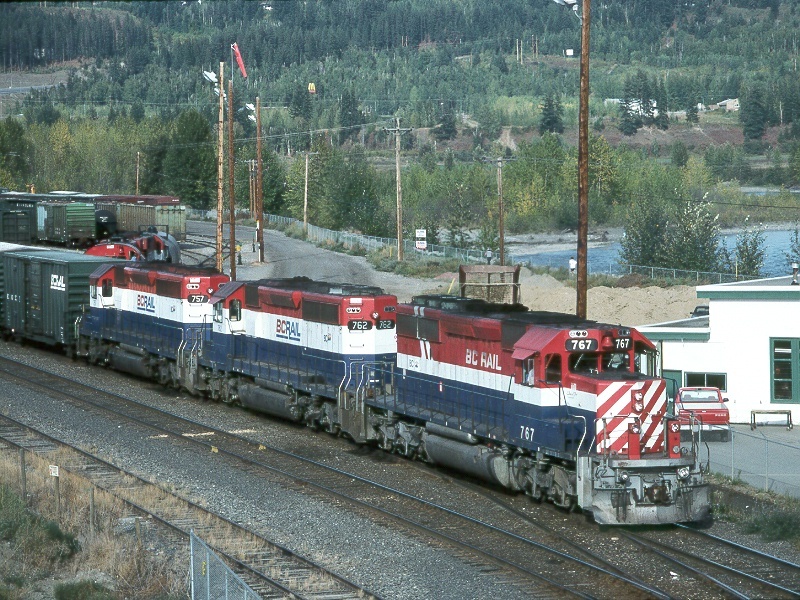 We then doubled back north and in Quesnel we found this set of SD40-2's getting ready to head south late in the evening. 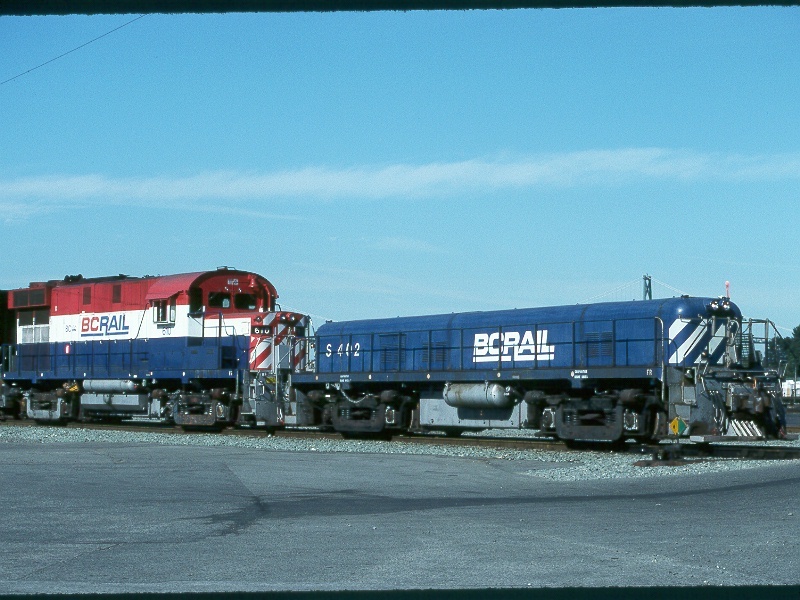 Never thought I'd foam over SD40-2's! Sept. 7, 1998. Check out the "2nd Section" for the rest of the trip! This Web Page and all photos on it are copyright ©1998 by Ted Ellis. All rights reserved.